A magical shamisen (a ‘three-stringed’ Japanese banjo-type instrument) enables a young Kubo to animate swirls of paper into origami and illustrate tales of legendary samurai. When he breaks the rule set by his mother not to stay out after sundown he is plunged into an epic adventure of his own across wild landscapes in this gorgeously crafted Laika production (ParaNorman, Coraline and Boxtrolls). The story isn’t particularly special, but it does go to some dark places thematically and includes some quite scary visuals. Kubo’s eye has been stolen by The Moon King, his scary aunts (voiced by Rooney Mara) arrive in plumes of malevolent black smoke and the perilous sequence on the ‘Long Lake’ is a sequence of stunningly arresting animation. The overall messages are the big ones in what is essentially a children’s story; family, good versus evil, learning and growing up through experience and in this Japanese-oriented drama – the oneness of life, remembering and honouring those who are now only memories. Ultimately a charming act of forgiveness and charity closes the film. Really the story is secondary for such groundbreaking filmmaking. The music, the detail and surreality of the scenes in all their diversity are the winning components. As the extras help to demonstrate, the team built around 80 small scale sets, full-scale monsters with innovative animatronics and hundreds of models upon which to map the special effects. The result is astounding and a magic unto itself. A particular favourite was how they mechanically created the effect of large storm waves using a copper circuit board and a draped piece of cloth. The models even have individually sourced and researched textiles, just like a live action movie. You never see the edges though when watching the tale unfold. Everything looks and sounds sublime. Journeying sidekicks Monkey and Beetle provide the camaraderie and the agency to move the story along, but they are a little predictable. Stern, cautious Charlize Theron-voiced ‘Monkey’, although remaining fierce with a blade, gradually softens up emotionally while McConaughey-voiced ‘Beetle’ shifts from pure comic relief to show some true mettle of his own. It’s Kubo that truly walks the deeper and more rewarding path. 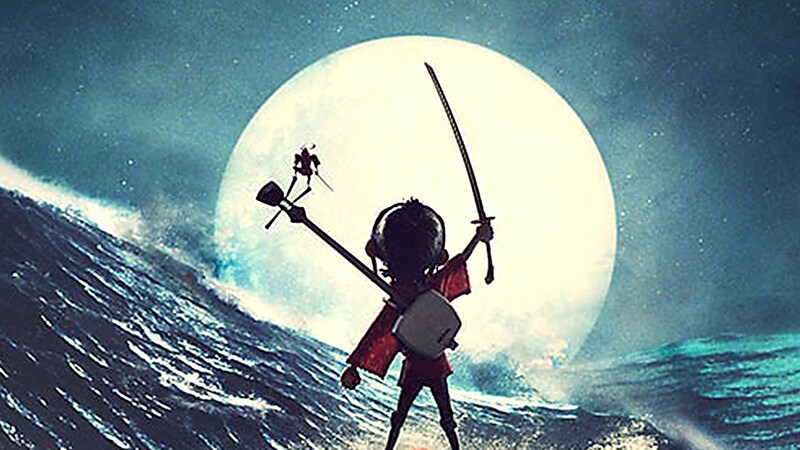 Kubo’s role as storyteller has a charming little cyclical trajectory as he returns to the very village in which he could never complete his invented, busked stories from the beginning of the film in order to finish it in actuality, as the heroic protagonist himself. Laika are growing in ambition and confidence. Unfortunately, Kubo has been their least financially successful box office release to date but don’t let the numbers get in the way.